Justice for our planet and justice for all people are two profound conversations that are happening simultaneously, but often in different rooms. The interconnectedness of daily human life and the state of the Earth often goes unexamined, but at this point in human history we cannot afford to separate these conversations. The assumptions that many people carry, that the Earth is separate from us and thus exploitable, are paralleled by assumptions that some people are different and inherently disposable—and this is the crux of the issue. Issues that impact the environment have impacts on the people who live there as well. And when some people have access to resources that help them relieve those impacts while others don’t, that becomes a social justice issue. From a community scale to a global scale there is an intense connection between people and the Earth, and harm to one cannot be escaped by the other. Our decisions as a species have led to intense changes in how the planet is functioning. These changes in climate aren’t arbitrary; they are having tangible effects across the globe. But the capacity for all populations to mitigate these changes isn’t universal. In many places climate change has had a hand in threatening human rights. A U.N. report on climate change stated that it is the poor who will suffer the most as the effects of climate change continue. “People who are socially, economically, culturally, politically, institutionally or otherwise marginalized are especially vulnerable to climate change,” it said. Although these effects are not exclusive to the poor, they have limited ability to deal and cope with them. For example, because of desertification, water shortages and crop failures, crop yields will continue to drop, and while this will eventually affect rich nations, it will first and foremost affect the countries and the people who aren’t able to afford higher-priced crops. 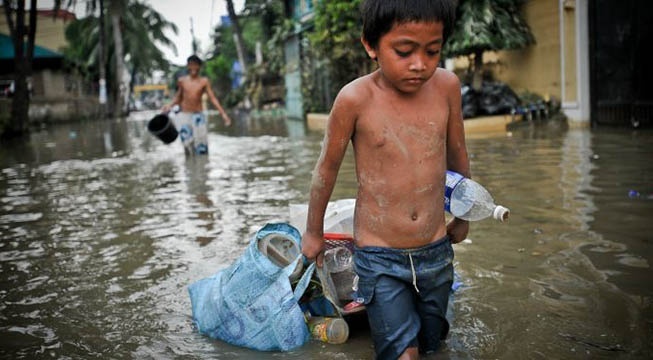 The poor are also hit hardest in weather-related disasters, such as heat waves or storm surges. And the number of natural disasters between 2000 and 2009 was around three times higher than in the 1980s—almost entirely because of climate related events. And as they find themselves subject to these adversities it makes it even more difficult to fight poverty. Even in more industrialized nations, social justice and environmental justice are undeniably linked. For example, industrial crop and livestock production damages the environment, threatens human health, degrades rural communities, harms workers, and compromises animal welfare. Common practice in industrial agriculture includes continually using the land, not rotating crop sufficiently, and over application of chemical fertilizers. In addition to degrading the land, workers in industrial farms and animal agriculture are subject to non-livable wages, hazardous working conditions and unfair labor management. According to the Centers for Disease Control and Prevention agriculture ranks among the most hazardous industries. Farmers are at high risk for fatal and nonfatal injuries, work-related lung diseases, noise induced hearing loss, skin diseases, and certain cancers associated with chemical use and sun exposure. Outside of farming, this correlation is seen in communities near oil refineries, power plants, or other toxic waste facilities. Research shows that hazardous waste facilities are disproportionately located in poor, minority neighborhoods. Residents living near these types of facilities are subject to both short-term and long-term illness. Symptoms such as uncontrollable vomiting and burning rashes have been linked to overexposure of emissions from drilling near residences and still very little has been done on a governmental level. Our indigenous partners in the Ecuadorian Amazon rainforest also embody the mutual inclusivity of social and environmental justice. As industries like oil continue to expand indigenous communities are needing to work harder and harder to protect the land that has been theirs for centuries. In instances like the Chevron oil spill in Ecuador, Texaco (who is now Chevron) defiled Ecuador’s northern Amazon rainforest by contaminating its soil, rivers and groundwater because of neglectful practices. In consequence, indigenous communities suffer from epidemics of cancer, birth defects, miscarriages, and have threatened the indigenous livelihood. And the dismantlement of any indigenous cultures can ultimately lead to a loss of deep wisdom and understanding that they hold about this planet. Photo by: Flickr user Asian Development Bank.